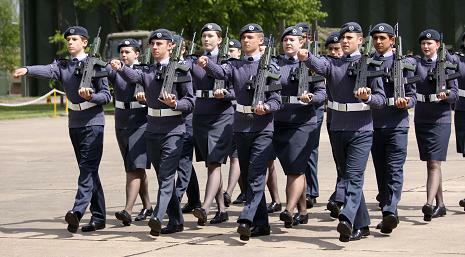 Many might argue that parade and drill are a waste of time in the Cadets, as it doesn't have much to do with adventurous training or sports, for example. However, drill has been used by Armed Forces for centuries, to develop discipline and organisation both individually and in a team. The Air Cadets are renowned for their high standards of dress and behavior, so parade and drill are a great way to demonstrate these. Once you have become an NCO, you could pass on your knowledge and experience to other Cadets, instructing them on how to participate in a drill squad, taking charge of a drill squad yourself, or even playing a major part in ceremonial drill. Being a Standard Bearer at a Remembrance Day parade is a real moment of pride and achievement for a Cadet, regardless of service. There is a opportunity to go on the annual RAFAC Drill and Ceremonial Camp. This is a fantastic opportunity to practice drill for an entire week with like-minded Cadets, looking at both rifle and foot drill amongst other things - the final parade will give you an amazing thrill!